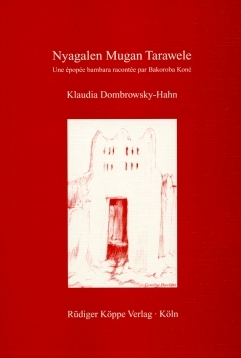 Author: Klaudia Dombrowsky-Hahn. Series edited by: Wilhelm J.G. Möhlig. The aim of the present study is to enlarge our understanding of oral literature in Bambara, the most important Mande language in Mali and across western Africa in general. It deals specifically with the epic poem Nyagalen Mugan Tarawele, one of the numerous heroic epics of Bambara which are recited by Griots. It deals with the time of Da Monzon de Ségou at the start of the 19th century. Central to the poem is the struggle between the warrior Samba Douga and his wife, Niagalé, which in the end sees her as the victor of their confrontation. The intention of the present book is first to preserve a stunningly beautiful piece of oral literature, impressive because of its rich metaphorical language, its style of recitation and the relevance of its message. The further aim is an analysis of the poem which focuses, not on validating the historical truth of the story, but the elaboration of the societal messages or morality inherent to the story. The interpretation is thoroughly based on the inner characterization of the protagonists and the background of the cultural environment of the Bambara. A French translation of the text, complete with numerous annotations, comprises the better part of the book. The first part of the appendix contains a breakdown of the poem into the several episodes, detailing the different discursive levels and providing summaries. The second part contrasts the poem with the Légende de Sorotomon as well as juxtaposing the version by Bakoroba Konè with that from Masala. Under accompanying material you will find further publications on oral literature and history of Mali.